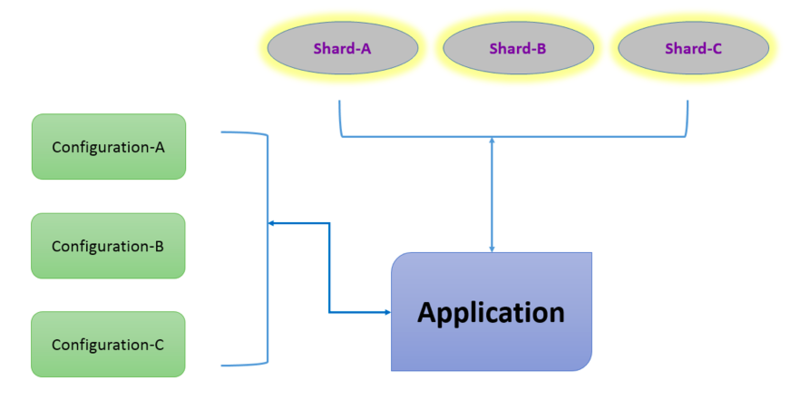 Sharding is the mechanism of storing data across multiple machines. The basic principle of this feature of MongoDB is to support the data growth which is expected any application. Because, at one point of time the accessibility of any application will definitely result in increase of the data growth and it would be difficult to accommodate such a growth of data. Considering the data growth which is really difficult to manage in a single system, it is an ideal way to have a cluster containing the replica set of the data. Hence, a horizontal scaling of the data is required and sharding does this in MongoDB. Sharding in simple just adds more machines to handle the sudden or rapid growth of data in an application. In data backup process all the data will be written to the master nodes. Space in local disk may not be huge enough to handle the data growth. The below figure shows the conceptual diagram of how the sharding works in a mongodb environment. Let us see the details pertaining to the components shown in the above figure. Application which is making use of the mongodb and needs to cluster the data across multiple servers. Shards are used to store the actual data. In any production environment each shard will be a separate replica set. Configuration is nothing but the configured mongodb servers that stores the cluster's metadata. Basically these configuration servers contains mapping of the cluster's data set to the shards. The query router will chose the specific shard based on the metadata for any target operations. In any production environment there will be actually 3 configuration servers.